Three hundred giant tanks, each holding more than 50,000 gallons of purified water, perch on the side of the Sierra Negra volcano in central Mexico, standing 13,500 feet above sea level. Four photosensors lie at the bottom of each tank. The array of tanks is part of the High-Altitude Water Cherenkov Gamma-Ray Observatory, or HAWC, a joint project of Mexico and the United States. While the technology is comparatively simple, the project is ambitious: observing gamma and cosmic rays, and contributing to the search for dark matter. Segev BenZvi, an assistant professor of physics, and fellow scientists are looking for very energetic gamma rays and cosmic rays that enter Earth’s atmosphere. When the high-energy rays interact, they create a “particle cascade”—a shower of high-energy particles—that falls to Earth. Lynskey 2015 Backroad Bike Technical Details AIR SHOWERS When high-energy gamma rays and cosmic rays interact high in the atmosphere, they create a particle cascade that peaks as it falls to Earth and wanes before it reaches the ground. The cascade looks like a pancake that grows wider and wider as it nears ground level. WATER CHERENKOV TANK ARRAY Giant water tanks outfitted with photosensors sample air-shower particles by recording the light produced when the particles move through the water. GAMMA RAYS Using the observatory, scientists can distinguish between air showers created by gamma rays and cosmic rays. At ground level, most of the signal from the particle cascade is centered around the direction of the initial gamma ray. But cosmic rays are much less orderly, breaking apart as they descend. A simple but groundbreaking observatory in central Mexico is shedding new light on the workings of cosmic and gamma rays in Earth’s atmosphere. Formally opened a year ago, the High-Altitude Water Cherenkov Gamma Ray Observatory will be used by scientists to gather information on high-energy particle acceleration for 10 years. The observatory is perched on the side of the Sierra Negra volcano, almost 14,000 feet above sea level. Segev BenZvi, an assistant professor of physics, helped to create the observatory and is part of the team now carrying out research there. BenZvi and colleagues on the project are studying extremely high-energy particle acceleration, from supernova remnants, black holes, neutron stars, and pulsars—“objects with very, very large amounts of energy, some of which is being dumped into accelerating charged particles out in space,” he says. When they interact, they produce gamma rays and cosmic rays. HAWC is a “scaled-up” version of a classic physics student experiment, he says, that uses a water tank in the lab to measure for muons—heavy, unstable versions of electrons that are the ground-level remnants of particle cascades. 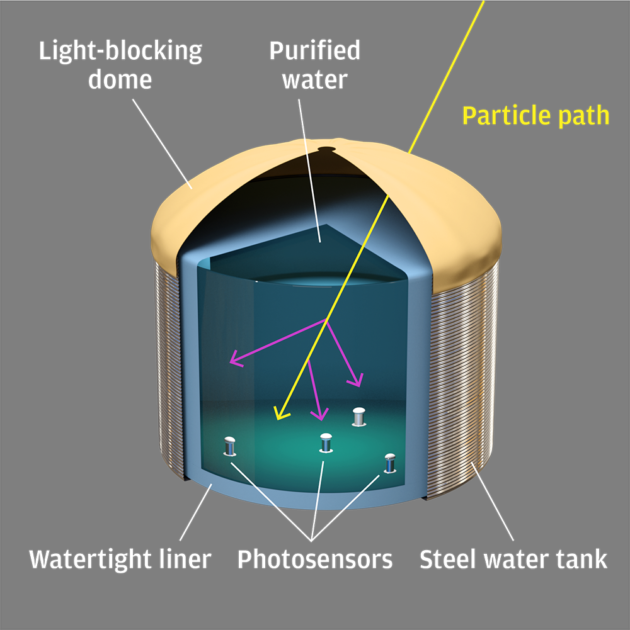 But the project is innovative in three ways: its high-altitude location brings better sensitivity to the particles, which get absorbed by the atmosphere as they descend; its “optically isolated, densely packed” tanks; and the algorithms that let the scientists make use of the data they assemble. Construction of the observatory began in 2011 at a site in the Parque Nacional Pico de Orizaba, a national park and home to the dormant volcano Pico de Orizaba, Mexico’s highest peak. HAWC was formally opened last spring. When the experiments are complete, in about 10 years, the scientists will restore the area to as close to its original condition as they can. The park is a “cloud forest,” with one of the highest tree lines in the world. An environmentally sensitive site, the forest affects cloud formation and rainfall in areas south and west of the park. No trees were removed in creating the observatory. The enormous tanks—23 feet wide and more than 16 feet high—are the same kind of tanks used by Midwestern farmers to irrigate their fields. A military contractor who manufactures “light-tight” tents for soldiers in hostile territory makes the tanks’ hemispherical domes. Local workers assembled the tank array, and then made 4,000 trips by truck up and down the mountain to haul the water to fill them—a volume of 55 million liters, or the equivalent of a soda can’s worth of water for each person living in Mexico. The tanks sample the air shower particles at ground level. There are about 100 million particles in a cascade at its peak. The number of particles decreases as the cascade descends. “It’s like a pancake of highenergy particles that moves toward the ground,” BenZvi says. When the particles hit the ground, they move through the tanks—and when high-energy particles move through water, they produce ultraviolet light, known as the Cherenkov effect. The photosensors in the tank record the ultraviolet light. And from the pattern of times that the sensors in each tank are triggered, scientists can reconstruct the direction of the particle pancake. The data they collect may also shed some light, as it were, on dark matter. When particles reach the ground, they move through the water tanks, producing ultraviolet light, in a process known as the Cherenkov effect. Photosensors in each tank record the light. By studying when the sensors are triggered, researchers can deduce information about the air shower of particles. But scientists don’t know how massive it is or what its interactions are. “So it’s entirely possible that some of the gamma rays and cosmic rays that we see are actually not produced by neutron stars and supernovae and things like that—they’re actually produced when clumps of dark matter interact and decay. That’s the idea,” he says. When anomalies are found in astrophysical data, scientists consider whether the source of the anomaly is a mistake in their model or the influence of dark matter. Telescopes offer another way to measure gamma rays. But they have a narrow field of view, taking in only a few degrees of the sky at a time. HAWC records information from two-thirds of the sky every 24 hours. Scientists are now processing their first year’s worth of data from HAWC, which they began to make public this spring. And they are expanding the array with some additional tanks—just a few, which will bring with them a four-fold increase in sensitivity. And there is talk of creating a second observatory, possibly in Chile. The southern hemisphere provides the best vantage point for observing the center of the galaxy—and it’s “a very strong candidate for observing dark matter, because we believe there’s a super-massive black hole in the center of the galaxy, and so there should be a gravitational well there where dark matter is concentrated,” says BenZvi. “If we have a HAWC in the southern hemisphere, literally the center of the galaxy will be right overhead,” he says.